Stand-up isn’t just having a moment — it’s having several. At the top, giants like Jerry Seinfeld and Chris Rock earn small fortunes with Netflix deals and sold out stadiums. Towards the bottom, comics like Hannah Gadsby are pushing the boundaries of the medium. And of course, the Internet has upended traditional models of distribution, with Netflix as the undisputed kingmaker of stand-up comedy. Standing in the middle of these exciting crossroads is a clean-cut comedian named Ryan Hamilton — affixed with his signature grin. His first special, appropriately titled “Happy Face” was released on Netflix in August of 2017. And now he's in Rochester. Starting today, July 19, Hamilton will be performing at Comedy @ the Carlson until Saturday July 21. Two things are immediately apparent about Ryan Hamilton. The first is that he is very good at what he does. The second is that he is about as far away from being an “edgy” comedian as possible. 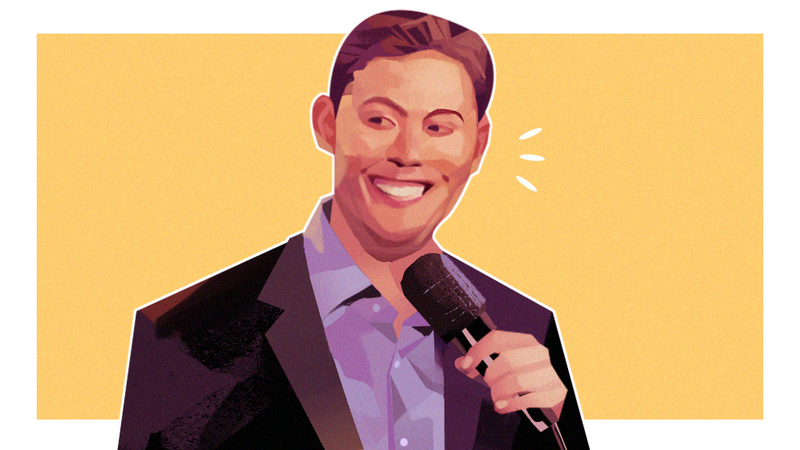 The term “clean comedian” can be a loaded term and — considering the raucous nature of many famous stand-ups — is a label from which many might shy away from. Hamilton, however, is simply clean by nature. While it may not be a conscious choice, it can be a lucrative one. Hamilton’s clean act matches his affable demeanor, making him a very easy pill to swallow. He keeps his comedy accessible and it doesn't feel anything but fresh and honest. “I actually have more opportunities career-wise because I can work anywhere,” he said. Hamilton has indeed worked everywhere — he’s performed as a semi-finalist twice on Last Comic Standing and has had stints on shows like Conan and The Late Show with Stephen Colbert. But the Netflix special was undoubtedly the most significant leap forward in his career. The rise of the World Wide Web — emphasis on world wide — has also changed where a comedian can perform. Hamilton’s audience has even extended to places where English is not the populace’s first language. That’s a lot of reach for someone who hails from a small town in Idaho. Regardless of cultural barriers, jokes need to be well constructed and battle-tested before they can make it onto a special. “I like to write in a way that can work anywhere, so if it doesn’t work anywhere, I tend to weed it out,” said Hamilton. By stand-up’s nature, this weeding has to be done very publicly. Bomb or not, the material has to be tried out. “There’s just no way of getting to good stand-up comedy without doing it in front of an audience many, many times,” said Hamilton. It’s a tough reality of the medium, but it's also part of stand-up’s appeal. It doesn’t matter if you have a Netflix special or you’re a no-name at an open mic — at the end of the day, the jokes have to land. According to Hamilton, it can take years to perfect a particular bit. The world of comedy is, of course, a lot bigger than stand-up — something that Hamilton recognizes. He’s now looking to TV to expand upon his career. “I’ve been working on ideas and pitching stuff for the last two years. Hopefully we can get something sold,” he said. Of course, comedy remains Hamilton’s first love — he won’t be abandoning the stage anytime soon. The glut of opportunity that has been afforded to stand-up comedians by Netflix is immense. It's so immense that some are saying the bubble’s about to pop. Many point to the early 90s, when such a bust occurred after a decade of stand-up mania. This doomsaying is probably true — tastes change and things go out of style, just like they always have. Stand-up existed before Netflix, before podcasts, before Twitter and will continue to exist after those platforms are long gone. There is no future devoid of stand-up comedy, even if it takes a very different form. But regardless of the medium or production value, the jokes will always be paramount. And Ryan Hamilton’s got some really good ones. See Hamilton perform live in Rochester today, July 19, this Friday July 20 and Saturday July 21 at Comedy @ The Carlson.